It's no secret that ENVE makes some of the fastest wheels in the game. In fact, they're constantly having to advance their braking technology in order to balance out the speed. The textured brake tracks on their SES range of wheels is a tremendous help, but the other half of that equation is the brake pads. 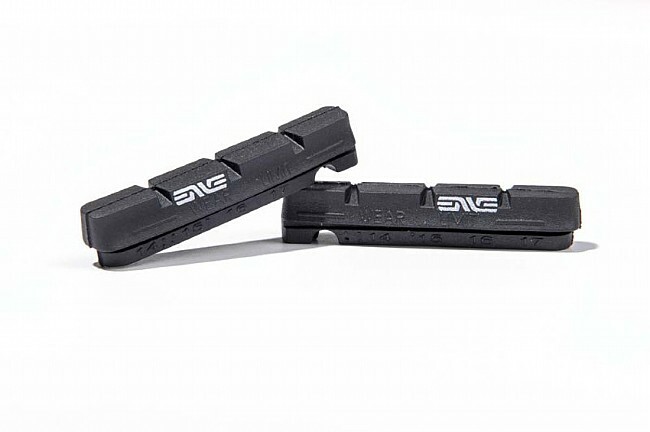 These ENVE Black Carbon Brake Pads are designed specifically for their molded-in textured brake tracks to provide the best power and manipulation while ensuring long-term durability of your ENVE SES wheelset. Sold as a set for one brake. Buy two sets to complete both front and rear brakes. For use with ENVE's molded-in textured brake tracks only. I ride almost daily and over one month did 27 rides, about 900 miles of hilly back roads and over 51,000 feet of climbing and descending. I have to de-glaze the break pad faces weekly. They hold up, other secondary market pads just melt on the ENVE carbon rims, so you have to have these to safely ride with ENVE carbon rim wheels with the textured brake surface. It's a high maintenance brake pad but you have to do it or you don't stop and no one will ride with you because you brakes squeal so bad is you don't de-glaze them with a file or course sand paper and wire brush. Stops the bike. Keeps your warranty. What else do you need?